The discussion revolved around President Obama‘s plans for employment and how to fix the problem. In addition to the quotes above he also said that Caesars isn’t looking to hire more and was critical of some of what the President’s plans were without coming off as cranky as Steve Wynn. The Linq seems to be aimed at the middle class and besides the rent from the 60+ stores, I’m not sure this will bring in more affluent customers. In fact, he doesn’t seem to think that it will draw more people, but it will give more people a reason to spend their money on Caesars land. I’m not sure I see a goldmine if The Linq ever gets off the ground. I’m not sure what the right answer is for the economy and Caesars Entertainment to do better is, but I don’t think I’ll be looking for a job there any time soon. Skip to 5 minutes into the show for the Gary Loveman segment, which lasts about 5 minutes or click here to go to the shows site. Keith Olbermann was entertaining to me when he was on ESPN Sportscenter. I didn’t watch Countdown on MSNBC because I tend to stay away from politics on TV. I don’t care about his politics, but he was fun with sports. I watch brainless TV and sports and I’m happy with that. Anyway, Olbermann got the boot from MSNBC and is now on Current TV and he’s still doing the “Worst Person In The World” sketch. 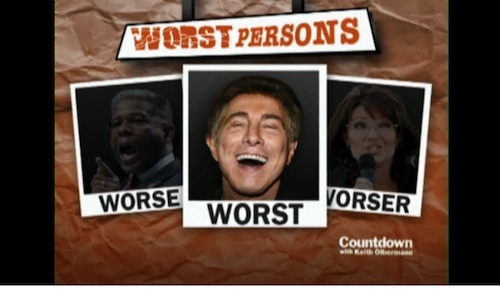 Last night Steve Wynn won the “Worst Person In The World” for comments he made about Barack Obama earlier this week. Evidently this made him a worse person than Sarah Palin and Congressman Alan West. When I started writing this post I asked who was more obnoxious Steve Wynn or Keith Olbermann and Olbermann won in a landslide. The comment that I echo is from Denver Gambler ” Olberman for sure, he doesn’t have a snazzy casino”. Now this brings up a new question: Would you rather be the “Worst” or “Most Obnoxious”? Steve Wynn seems to care only about one thing – his business. There’s nothing wrong with that and there’s nothing wrong with the recent quarterly financial results at Wynn. Every quarter Steve Wynn takes a few minutes of his conference call to discuss what politics are helping or hurting his business. For the past few quarters he’s railed on President Barack Obama. This quarter was no different. Speaking to investors on a Monday conference call, casino developer Steve Wynn – calling himself a “Democratic businessman” – went on an extended rant against Obama and his policies. “Until we change the tempo and the conversation from Washington, it’s not going to change,” added Wynn, according to a transcript of the call’s question-and-answer session. Steve Wynn owns the company and is allowed to use his quarterly earnings reports as a soapbox, so I don’t see anything wrong here as much as I feel his constant complaints to be boring, repetitive and obnoxious. Extreme talk like this (good or bad) just makes me tune out Steve Wynn. Frankly, the only reason I’m passing this info on is because I know others find it interesting. If you’re interested to hear the Wynn conference call you can get it here. Sensational headline? Maybe. Judging what Steve Wynn says in this video it seems as he doesn’t like nor agree with the Barack Obama and his staff’s current political policy. This isn’t the first time Wynn has gone off on a politician, but it is a new interview which, seemingly, was meant to discuss the excellent first quarter earnings Wynn had. Thanks to @brian_fey for the heads up. Steve Wynn says in an interview with MSNBC that he’s considering moving Wynn headquarters to Macau. Obviously, he’s trying to butter up the market but that likely won’t ever happen. Especially as gaming revenue growth in Macau has probably already peaked in popularity. Gotta love corporate speak. On another note, his attitude towards creating beautiful and quality hotels is fantastic. I love the line “I don’t think bigger is better. I think better is better.” I’d rather focus on that attitude than the corporate gibberish.